These spy shots show it’s not on its way out, though – instead the latest version of the engine is spreading to revitalised supermoto and enduro versions into 2019. Back in 2016, the 690 Duke gained a massively redesigned version of the engine to help it comply with the latest European emissions limits. Its bore stretched from 102mm to 105mm while the stroke shrank from 84.5mm to 80mm. Its capacity remained the same, but as well as the new piston and crankshaft there was a new cylinder head. An extra balancer shaft, unconventionally positioned inside the head, helps make it uncannily smooth for a single. On the Duke, the changes gave a seven per cent power boost to 54kW, and a six per cent torque increase to 74Nm. Numbers particularly impressive for a single. While this spy shot, which show the revamped 690 SMC supermoto (and there were images we spotted of the 690 Enduro, too) that will both debut in KTM’s 2019 range, doesn’t give us much technical detail, it’s virtually certain that they’re using the Duke’s Euro 4-spec engine, with all the benefits that carries. Engine aside, the bikes appear to be using much the same frames as the old 690 SMC and Enduro models, which have disappeared from the line-up this year. With the usual KTM steel trellis design, they’re proven to be light and rigid, so there’s little reason to alter them. As on the old models, the plastic fuel tank doubles as the subframe, saving even more weight and eliminating the need for separate, cosmetic bodywork. The 2019 machine’s tank is clearly reshaped, though, giving a new look and potentially increasing fuel capacity. Similarly, there’s new front bodywork including reshaped radiator shrouds and a new, 690 Duke-style headlight unit. 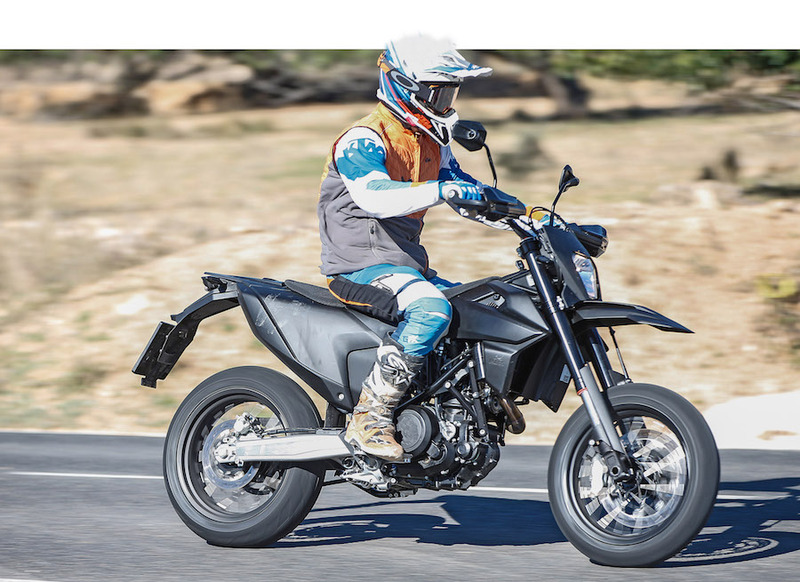 The SMC supermoto version of course gets road-going wheels and tyres, 17-inches at both ends. The WP suspension, Brembo radial brake caliper and the wheels themselves all look unchanged from the outgoing model. The Enduro, in contrast, has a 21-inch front and 18-inch rear wheel, again carried over from the old model. The bikes are just two of a bewildering number of upcoming KTMs that have been spied testing in recent months, ranging from additional models using the new 790 RC8c twin to an all-electric version of the Duke. If you can’t wait for 2019 to get on a new supermoto or enduro, you’re in luck. Sister firm Husqvarna already offers the 701 Enduro and 701 Supermoto models, using exactly the same engines, frames, suspension and brakes.